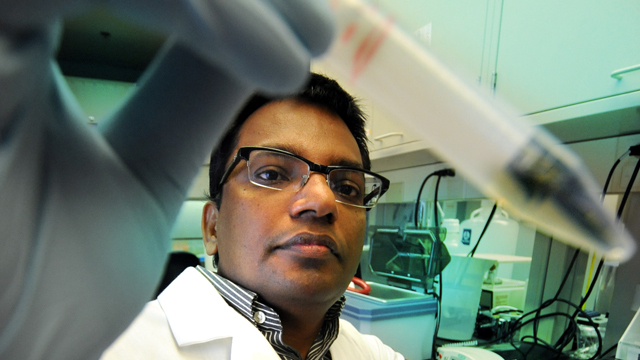 Above: Dr. Anilkumar Pillai, MCG neuroscientist, published a study in Molecular Austim about the impact of estrogen on autism. The new findings that reduced expression of estrogen receptor beta as well as that of an enzyme that converts testosterone to estrogen could help explain the high testosterone levels in autistic individuals and higher autism rates in males, Pillai said. Comparing the brains of children with and without autism spectrum disorder, the researchers found a 35 percent decrease in estrogen receptor beta expression as well as a 38 percent reduction in the amount of aromatase, the enzyme that converts testosterone to estrogen.